SIHH 2015: Introducing the New Officine Panerai Luminor Submersible 1950 CarboTech 3 Days Automatic PAM 616. Live Pictures and Pricing. Today, we were able to check all the Panerai novelties that include three Luminor Submersible 1950s, a couple Equation of Time pieces and a Mare Nostrum in titanium with tobacco dial. 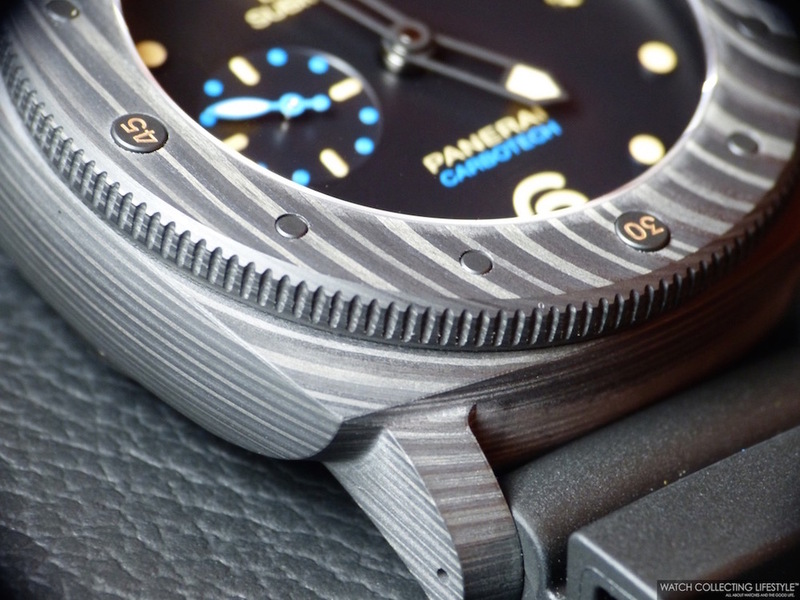 Here, we have the live pictures we took of the new Panerai Luminor Submersible 1950 CarboTech 3 Days Automatic PAM 616. The Luminor Submersible 1950 Carbotech 3 Days Automatic presents a remarkable new technical innovation with its case made of Carbotech, a composite material based on carbon fiber, never before used in the world of watchmaking and a technology owned by Panerai. While the technology of the material looks to the future, every detail of the design of the watch is faithfully inspired by the history of the brand. The Luminor 1950 case measuring 47 mm in diameter, was originally developed by Panerai in the late 1940s to be worn on the wrists of commandos of the Italian Navy. This case is enhanced by a rotating bezel with markers consisting of small studs, inspired by the model created by Panerai for the Egyptian Navy in 1956. The bezel rotates only anticlockwise and enables the time of immersion to be calculated, a very useful function for a professional underwater instrument which is tested for water-resistance up to 300 meters. The watch features 'ecru' superluminova and a black rubber strap with blue OP logo accents and trapezoidal titanium buckle with DLC coating. As you can appreciate in these pictures, the look of the case is very similar to that of wood grain and very soft to the touch. The watch is quite light weighing 126 grams but very solid. The new Panerai Submersible 1950 CarboTech 3 Days Automatic is powered by the in-house Panerai calibre P.9000 with 28 jewels, two barrels, 197 components and which beats at a frequency of 28,800 vph to provide a power reserve of 72 hours —3 days. The movement is protected by a black DLC titanium solid case back with the S.L.C 'Siluro a Lento Corsa' logo. On the wrist, the watch wears light and true to its size but siting high up on the wrist. This CarboTech is for sure a watch that more than one would like to get as soon as it hits the stores. Sticker Price Approximately $19,000 USD. For more info on Panerai click here. Posted on January 20, 2015 by Editor & Publisher and filed under Panerai, SIHH, SIHH 2015 and tagged Panerai Luminor Submersible 1950 Carbotech.